SAINT LOUIS (June 17, 2013) -- On a day where separation was on the order, just the opposite was on the plate. Now everybody is throwing punches at the Chess Club and Scholastic Center of Saint Louis. Round 3 featured defeats of IM Victor Shen and FM Atulya Shetty, who had been the early frontrunners of the tournament heading into Sunday, and points on the board for both FM Jeffrey Xiong and WFM Sarah Chiang. Three draws on the day tightened the rankings instead of providing distance, as now seven players of the field of ten all sit within a point of each other. 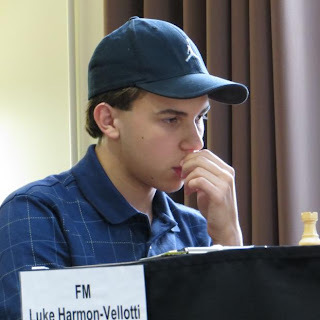 FM Luke Harmon-Vellotti now stands alone on top with 2.5 points, after a win that has been two months in the making. Payback rang in the Idaho FIDE master’s mind as he took the chair across from FM Atulya Shetty for the second time, the first coming in the final round of the record-breaking 2013 K-12 Super Nationals last April. There, Shetty served Harmon-Vellotti a loss that not only disrupted the 14-year-old’s perfect 6-0 record, it also bounced him from the top spot to put Shetty in clear first. An instant rivalry. Shetty rolled out with an English attack and the game moved quickly through the first 14 moves, until Harmon-Vellotti knocked him from his prep with 14. … Nd8. The move looked to ready c6 and kick Shetty’s knight from the powerful d5, but Shetty retreated the knight willingly with 15. Ndc3 and Harmon-Vellotti’s response of 15. … c5 invited him right back in. It brought a muddled and closed center where knights became the highlight, and Harmon-Vellotti found one to reign supreme. His 22. … Qb5 produced a fork for material advantage, but it brought much more. Shetty’s response of 23. b4 surrendered the pawn on d5, but also allowed Harmon-Vellotti’s knight a path toward a nasty outpost on e3. The position proved more valuable than the exchange, as the knight stayed put despite attacking Shetty’s rook for four moves. When it finally did move, 31. … Nd5, it produced a lethal discovery that left three of Shetty’s pieces attacked at once. Surrender came four moves later. The tournament’s other leader IM Victor Shen, who had a perfect two points through two rounds, also stumbled with the white pieces in a marathon match versus Robert Perez. Shen’s e4 was met with a particularly sharp Najdorf line of the Sicilian, one Shen admitted that a lack of familiarity with helped aid his defeat. Of particular focus was 12. Nxe7, a voluntary move from Chen that swung the pendulum heavily into Perez’ favor. While it did disrupt castling, the response of 12. … Ke7 put Perez’ monarch into perhaps an even cozier safe spot, as it never felt a whiff of danger for the rest of the game. It also made a streamline of mobility for Perez’ major pieces, which had a battery set just three moves later on the half-open c-file, beating down on Shen’s king. It pushed Shen’s forces into an extremely packed a1 corner and, with both a- and b-pawns charging, Perez looked to blow open the meager defenses. But Shen took advantage of some inaccuracies and played well with his back against the wall, ultimately wiggling free from the tight corner with minimal casualty. He finally traded his “piece of garbage” knight, which sat for 27 moves on the a1 corner, for a pawn and an opportunity to queen his a-pawn. Perez, however, offered some fantastic queen and knight work in the closing moves to secure the win. Naroditsky discussed his decision to push forward into a draw against Harmon-Vellotti in round 2 as a “prudent decision,” but his draw against Kayden Troff in round 3 was more of a desperate cling. The two IMs paired off in one of the most anticipated matchups of the day, and despite the uneventful result, the game itself offered plenty of fireworks. Naroditsky’s preparation knew of his opponent’s penchant for the Grunfeld, so he came at Troff with the Anti-Grunfeld System, refraining to play d4. All looked well for the California 17-year-old through the opening, until he decided he didn’t want to just pick a quiet fight with Troff. Instead, he put his head down and charged. Indeed, Troff was agile in his dodge of the premature attack, immediately swapping out the f3 knight and swallowing Naroditsky’s e-pawn. In four moves, Troff had completely unpacked his position, centralizing both knights with incessant harassment to the black queen. Though the loss of his d-pawn stacked Troff’s own d-file, a weakness Naroditsky would later recollect, his king cowered from several dangerous files and diagonals that Troff dominated for much of the game. But Naroditsky held out, breaking the game down to a rook-and-pawn endgame and eventually converting his only remaining weakness – stacked and isolated e pawns – into a balanced position. Both WFM Sarah Chiang and FM Jeffrey Xiong, scoreless through the first two rounds, were able to break the seal with draws in round 3. Chiang had white against FM Yian Liou and came with the Leningrad system in the Dutch defense. Though the center showed early signs of closing, it sprang open quickly by move 15, with both sides being relieved of their oft-problematic pawns in such positions – c4 for white, and d6 for black. The game stayed quiet throughout, mostly jockeying for better position between the two sides, and Chiang easily dealt with Liou’s only endgame threat in a passed pawn. 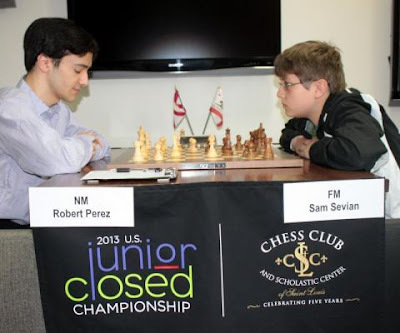 FM Sam Sevian played Xiong to a draw in a battle between the two youngest competitors in this year’s Juniors field – both 12 years old. And after a round 2 match versus Perez, where Sevian played a race through theory that went 26 moves deep, he was relieved of such preparation versus Xiong in just one move: Sevian prepped fully for a Xiong’s c6 or c5 response, and instead got 1. … e6.